The Foreign Office on Friday is releasing to The National Archives a stack of until now secret files from the British occupation authorities that ruled Palestine until 1948. The Electronic Intifada was invited to a press preview of the files on Wednesday and had a chance to read many of the newly-released documents, mostly from the 1940s. Although there were too many documents to even skim in one day, the files seem to give a fascinating insight into the final days of the British “Mandate” over Palestine. One file (FCO 141/14284), a collection of weekly intelligence reports from the High Commissioner for Palestine to the Colonial Secretary in London, ends chillingly. The last document in the file is dated 10 April 1948 and contains an initial report on the Zionist massacre in Deir Yassin which had happened only the day before. The Jews … seized part of the village of Deir Yassin. The latter operation is believed to have been a joint N.M.O. [National Military Organization, aka Irgun]- Stern Group enterprise undertaken with knowledge of the Haganah [Zionist militia]. Arab casualties are believed to have been heavy. The report, marked “Top Secret,” does not elaborate on the more than 100 Palestinian villagers, including women and children, who were murdered that day. While the files I’ve looked at so far appear to contain nothing totally new, they do give some interesting details. Another file (FCO 141/14283) is a collection of telegrams and reports from 1948, but coming from British police, it is more military-focused than the politically-oriented reports of the High Commissioner. It contains an interesting episode. A report dated 27 April 1948 by one R.C. Catling, Assistant Inspector General with the Criminal Investigation Department (plain-clothes detectives) shows that some British officers decided to take the Palestinian side. The Arabs appeared to be led by two Britishers, one of whom was recognised as an ex-B/Constable whose name is unknown and the other man is thought to be an ex-B/Constable Brown, who escaped from Acre after being sentenced to four years’ [sic] imprisonment. 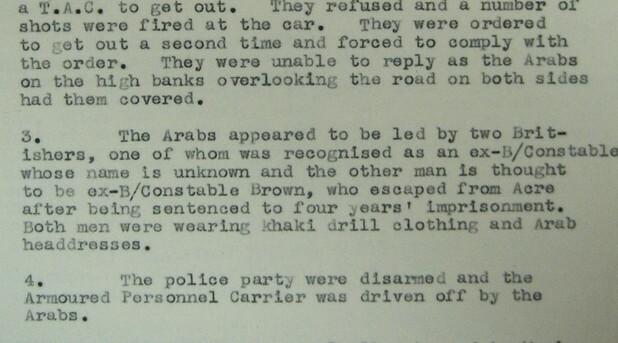 Both men were wearing khaki drill clothing and Arab headdresses. The armed police drivers had their weapons and APC confiscated, but were apparently released unharmed. The report is reminiscent of Peter Kosminsky’s 2011 TV serial The Promise in which a British soldier, despite being initially sympathetic to Zionism, becomes disillusioned with the British role in Palestine and deserts to join Palestinian fighters who unsuccessfully attempted to defend the country. Although fictional, Kosminsky based his drama on real history, including original research and conversations with surviving British colonial soldiers. Several of the files (FCO 141/14256, 14270-73, 14288) concern Germans, Italians and Iranians interned as enemies during the Second World War, and sent from Palestine to prison camps in Australia. Some of the Italians were said to be priests sympathetic to fascism. Many of the Germans were members of the Templar colony Sarona near Jaffa, which was expropriated and used as a British military base. Another file (FCO 141/14285) contained correspondence from worried British subjects seeking to flee the country after the UN decision to partition Palestine. Other newly-released files, which I did not have the time to review, are said to contain details of Hijaz railway assets to be handed over to “the Transjordan government” (modern-day Jordan). The documents are part of a wider collection from former British colonial administrations around the world designated the “Migrated Archives.” During the process of decolonization, British occupation authorities wanted to ensure that any evidence of their wrongdoing was covered up. Files that “might embarrass HMG [Her Majesty’s Government] or other governments” were either destroyed, or “migrated” to London. Former Mau Mau fighters, veterans of the Kenyan independence struggle, are suing the British government for torture during the uprising. In the course of that legal action, the government was forced to concede in 2011 that the files did in fact still exist. The files began to be released to The National Archives last year and are due to be fully released by November. This fifth tranche of documents includes files from Kenya, Nigeria and (for the first time) Palestine. The government is reported to still be withholding release of many files, including one concerning compensation paid after the 1946 Zionist bombing of the King David Hotel in Jerusalem. the uk did not want to fight the new Israelis, because it would be seen by most of the world as very unjust at least. on the other hand the uk was mostly on the side of the arabs, but could not come out and demonstrate that feeling. the uk was between a rock and a hard place.